‘Sustainable Diets’ is a Hivos-supported video channel presenting interesting short films about new ways of producing, distributing, cooking and consuming food. But not just any kind of food. Here the focus is on healthy, diverse and sustainable food. The channel explores innovative ways in which we can achieve food and nutrition security, guaranteeing an affordable and nutritious meal for everyone. The films feature the perspective of ordinary people in various continents on healthy and diverse foods and new initiatives for low-income consumers You can not only enjoy the latest clever alternatives for current mono-cropping, processed food and boring meals, but add films of your own, thereby helping the station to collect the best videos on innovation for sustainable diets. A few of the more surprising videos you will find on the channel are: sack gardens in Kenya, a solar oven in a tire (!) for under $5 from Uganda, and the high “hidden costs” of hamburgers. 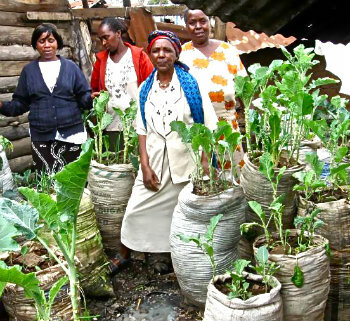 The “garden-in-a-sack” project in Nairobi is the first film in a series of special reports about healthy and sustainable food produced by TIS and with the Metropolis television network with special support from Hivos. The Sustainable Diets channel is a collaboration of The Innovation Station (TIS.tv) with the ‘Sustainable Diets 4ALL’ initiative of the Hivos Green Society programme. TIS’s October theme of food also celebrates World Food Day on 16 October and fits in with a special Hivos food seminar on 19 October as part of Age of Wonderland 2015 during Dutch Design Week in Eindhoven. Hivos believes the world produces more food than ever. However, a world where people have access to healthy and nutritious food produced in a manner that ensures food security now and in the future, is further away than ever. The current food system is based on monotonous production, which creates a monotonous food consumption pattern. It is not only unequal, the quality of what is produced and made available to consumers is also far from adequate, from a human and planetary perspective. Hivos therefore has developed the Sustainable Diets 4ALL programme that works towards more sustainable, healthy and nutritious food available to all, in particular for low-income consumers, now and in the future.